Most Riesling connoisseurs have long considered Germany, specifically the Mosel Valley, as the varietal’s rightful throne. This is probably still true. The Mosel Valley’s unique, steep slopes of sun-absorbing slate have allowed the cool climate of Central-Western Germany to create ideal Riesling wines for over 150 years. But, as Riesling slowly grows in popularity, vintners around the world, the United States included, are giving it a go in new regions and climates. It is no wonder. While the retail sales of Pinot Gris outgrew all other white wines from 2004 until 2007, Riesling has taken that title for the last few years. The Finger Lakes region of New York and the state of Washington remain riesling’s top two areas of production respectively in the United States. 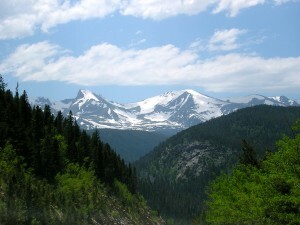 At the same time, the grape seems to be finding an unexpected home up and down the Rocky Mountains. From Boise, Idaho to Dayton, Montana, from Grand Junction, Colorado to San Fidel, New Mexico, riesling is flourishing. This seems to be due to three qualities which the Rocky Mountains share in common with Germany’s Mosel Valley: terroir, a balance of elevation and latitude, and the appropriate orientation, slope and growing season to bring the grapes to maturity. Grand Junction makes an excellent comparison to Germany’s Old World riesling growing regions. While the Mosel’s soil is almost ubiquitously slate, Grand Junction and the rest of Western Colorado’s soil has been built on Mancos shale, which when put under pressure often forms slate. Western Colorado also boasts a soil plentiful in gypsum and calcium, and its water supply runs rich with calcium carbonate. All of these things create the potential for great riesling growing soil, which is made even more significant by the fact that riesling is widely known for its dependence on terroir rather than winery production acrobatics used for creating great wine. Obviously much more occurs in the soil and microclimate of the Mosel Valley in order to create wonderful Riesling wines, but bold winemakers seem to be discovering a modicum of these factors throughout the Rockies as well. In and around Grand Junction several vineyards are currently growing the grape with great success. Reeder Mesa and Plum Creek have both won awards with their Colorado grown rieslings. Plum Creek planted their vines as far back as 1980 and has won multiple awards with its 2004 vintage. In Canon City, CO, 250 miles away from Grand Junction and just south of Pikes Peak, Spring Creek Vineyards has planted almost half of its acreage in riesling. Comparing elevation and latitude is a bit more tricky. 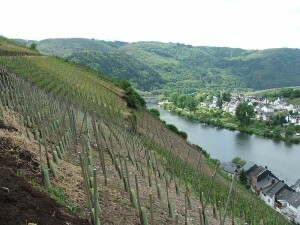 The Mosel Valley rests around 49º N latitude with elevations from 300 to 1,200 feet. In contrast, riesling in the Rockies is grown anywhere from 43º N latitude and 2,500 feet in elevation around Boise, ID all the way to 6,400 feet at San Fidel, NM (west of Albuquerque) which rests around 35º N latitude. Each riesling growing location in the Rockies seems to be able to make up for its more southern latitude with increased altitude in order to rediscover a good balance for growing the German and Austrian classic variety. 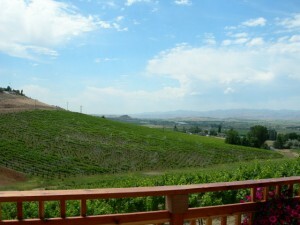 The larger Boise area in Idaho is establishing a name for itself largely due to its sweet and semi-sweet Riesling wines. At 2,500 feet in elevation, Ste. Chapelle, the largest winery in the area, has been producing award winning Riesling wines for over 30 years. Snake River, Indian Creek, Bitner, and many other producers are also doing quite well with the grape. It should be mentioned that Boise is not the northernmost producer of Riesling. Another eleven hours north and you arrive at Dayton, on the shores of Flathead Lake. Even in this beautifully remote area riesling has found a tiny niche. Most of Mission Mountain Winery’s riesling grapes come from their larger vineyards in the Rattlesnake Hills and Snake River AVAs. 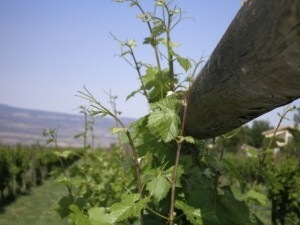 However they also source the cool weather variety from a small vineyard right on the shores of Flathead Lake. At the other extreme end of the Rockies, Guadalupe Vineyards in San Fidel has claimed several medals for their 2008 Riesling, made from fruit grown at and elevation of 6,400 feet. Ponderosa Valley Vineyards, the largest riesling producer in New Mexico, grows their award-winning grapes at 5,800 feet elevation. Like in the Mosel Valley, slope, orientation and growing season are vital to success in the Rockies. With proper exposure to sun, these high elevation rieslings seem to be able to withstand cold winter temperatures and create great wine in cool climates. In terms of average annual growing degree days (when the average temperature exceeds 50ºF, considered optimal for grape growing) most of Germany would be classified as Region I with under 2,500 hours. Grape growing regions in Western Colorado and Northern New Mexico come in around the same averages, while some of the Snake River AVA in Idaho can extend into Region II with over 3,000 hours. Rocky Mountains of Colorado, ideal for Riesling? Although it may seem counter intuitive to successful growth in the Rocky Mountains, riesling is known for requiring a relatively long growing season, but its later bud break allows it to flourish in areas that could suffer losses due to late spring frosts. In Colorado, riesling bud break typically occurs in early May rather than in April like many other varieties. The average growing season for riesling in Colorado has been 160 days, meaning the grapes are ready for harvest sometime in mid-October. This growing season matches up well with much of the Rocky Mountains where hot September afternoons can go a long way towards ripening late season grapes. While similarities can be found between growing regions in the Rockies and Germany’s Mosel Valley these alone do not explain the expansion of Riesling into previously unknown areas. Even despite stiff resistance from many who doubt the viability of doing so. Many argue that the New Word cannot create good Riesling at all, yet areas new to wine production continue to produce quality Riesling wines. Part of the reason behind Riesling’s spread into the Rockies may simply be due to the American pioneers that tend to settle here, and their sheer determination to make great wines they can share with their neighbors and be proud of. Whatever its reason for expansion, with its vast flexibility and wonderful aromas, Riesling should continue to increase its share of the global wine market. Who knows, maybe the Rocky Mountains could become a major New World contendor in producing great wines from this Old World grape. After all, wine production is always driven by either madness, ignorance, or genius in varying proportions. David Mark Brown is a freelance writer and author as well as a home winemaker and proud owner of his urban vineyard (of 12 vines). You can follow David’s current projects at his web site: David Mark Brown Writes. David and his family currently live in Salt Lake City and have lived in the Rocky Mountains for the last seventeen years. great article…..learned quite a bit about other riesling growers & producers. Idaho definitely has some great rieslings and as we visited RMNP this past summer and experienced some CO riesling, we look forward to trying others you mention as well. Thanks for including us in your article. 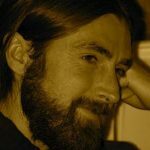 This post was mentioned on Twitter by palatepress: The Rise of Rocky Mountain Riesling – http://b2l.me/mr2ta David Mark Brown gives us another great story…. Very well done article, indeed. Please allow me to make one slight correction. Your first sentence last part ‘…..as the varietal’s rightful throne.” Riesling or any other grape is a variety not a varietal. A wine may have varietal aromas, bouquet etc.or may be a a varietal wine when different grapes are used in the blend, but a grape is not a varietal. I just did a post entry on my blog on January 7 this year. You are correct that riesling the grape is a variety, not a varietal. But Riesling the wine is a varietal. In the sentence you point to, “Most Riesling connoisseurs have long considered Germany, specifically the Mosel Valley, as the varietal’s rightful throne,” the reference is to Riesling as a wine. There are certainly a few riesling grape connoisseurs, most of them working in vineyards, but we reviewed this story and edited it assuming “Riesling connoisseurs” referred to educated lovers of the varietal wine. If you look through the article you will see that we follow a style sheet that rules we capitalize the varietal wine but use lower case for the grape variety. Thank you so much for commenting. Your general statement is correct, and there is no doubt people use “variety” and “varietal” incorrectly quite often. Thank you for the great wine. Looking forward to another season of farmer’s markets in BoDo. Hope to see the folks from Indian Creek there. It was a nice surprise to see us mentioned in your article. Thank you for mentioning us. I also thought the article was excellent. Your description of the latitudes of German being similar to the altitudes of New Mexico was dead on. Personally, I think we have something going with the terroir of Riesling here in the Rocky Mountain states. Like Germany, I am not able to produce any red varietals, but I am sure able to produce a nice dry, light, citrus tasting Rieslings. Hopefully, we can be an alternative to the heavy, fruity bombshells of California and Australia. Keep up the good work of educating us, and in time people will know that they do have some great local wines in their backyards. Thank you for the kind comments. I am hoping sometime this next year to be able to make a trip through New Mexico, and I would love to stop by and visit if it works out. My family lives in Texas, so we are planning a road trip from Salt Lake at some point. I hope you have another great season this year. Dave, I have had the opportunity to taste Antonio’s Riesling and other wines produced by Guadalupe Winery you won’t be disappointed. After having served as a wine judge in Boise, Idaho last April, I came away convinced that local Riesling will one day be a rival wine to my home location, which is the Finger Lakes. Love to have you stop by. Will look forward to your visit. Great article! Thanks for including Bitner Vineyards in your article.